The reaffirmation of PUD Commission Boundaries was approved on March 28, 2017 under Resolution No. 721. 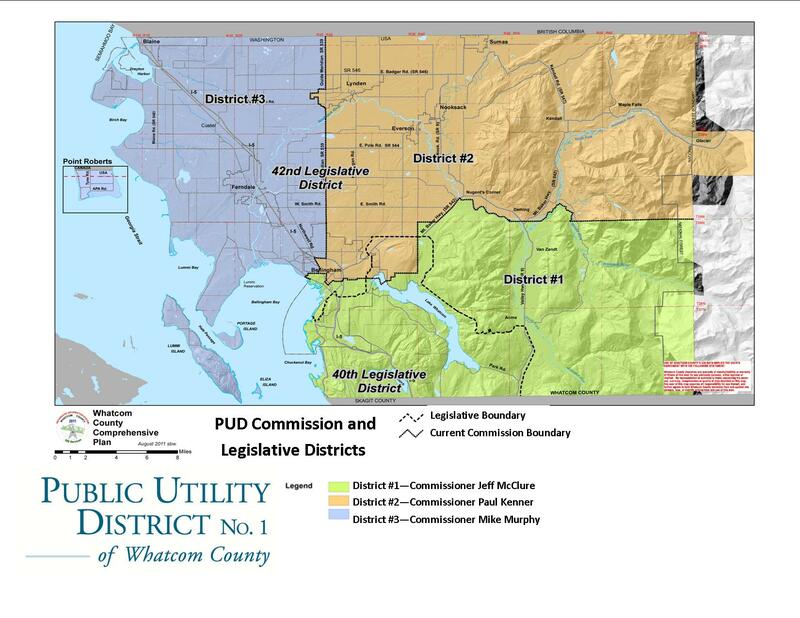 While Whatcom County Council increased its Legislative Districts from three to five in 2016, the PUD Commission is not required to change the District’s boundaries commensurate with the County. Pursuant to RCW 54.12.010(6), the boundaries of a public utility district shall be examined every ten years according to the provisions of Chapter 29A.76 RCW, which provides the criteria for redistricting of counties, municipal corporations, and special purpose districts. In early 2017, the PUD conducted a review of the existing District boundaries according to the criteria outlined in RCW 29A.76.010 and analyzed the 2010 federal decennial census information for Whatcom County. Each Commissioner District is as nearly equal in population as possible to each and every other Commissioner District comprising the Public Utility District such that the variation of population according to the 2010 Census Population Data is less than 2,270 people or less than 3.2% per District in all instances. Given the size of the Public Utility District and the distribution of population within the Public Utility District, each Commissioner District is as compact as possible. Each Commissioner District consists of a geographically contiguous area. No comment was received by any individual or entity that the current or proposed Commissioner District favored or disfavored any racial group or political party. Nor has any such complaint been received by the District since the Commissioner District Boundaries were last established. The Commissioner District Boundaries coincide with existing recognized natural boundaries and, to the extent possible, preserve existing communities of related and mutual interests. These boundaries, where possible, follow highways, roadways, section lines, and neighborhoods.